Always happy to have a writer of historical fiction as my guest. This week we have the talented and prolific Barbara Gaskell Denvil, who talks with such enthusiasm about writing her medieval English novels that you can't help but want to read them! Echoes in the night, running footsteps on the cobbles, the flicker of a candle flame at a window, distorted behind thick green-tinged glass. Outside in London’s alleyways the darkness is intense as the moon is hidden behind the rooftops with their soaring chimneys. But suddenly there’s the flare of a torch and its sizzle of fire. The Watch is coming – following – calling! But the light is then extinguished, in the wind. Panting, losing breath, whispers. The lanes are narrow and the central gutters are thick with rubbish. The footsteps continue, though now fainter in the distance. He is getting away. 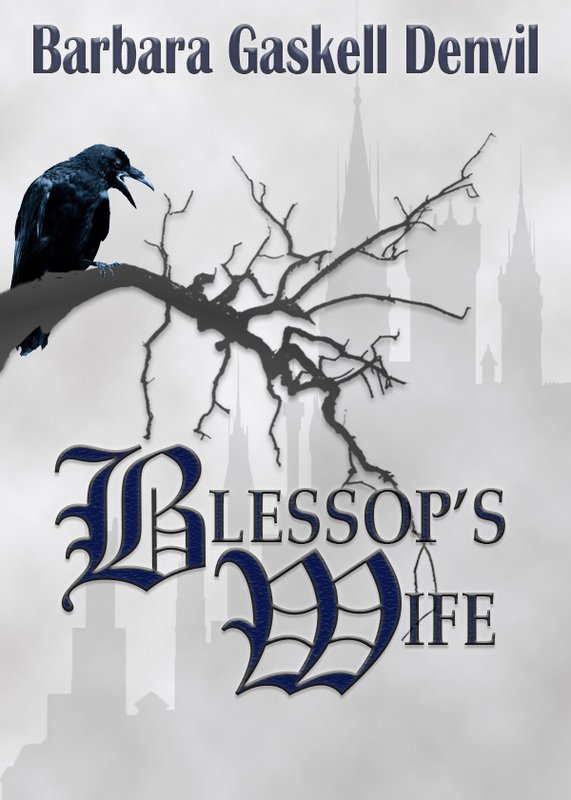 I write historical fiction, and my books are set in late medieval England around the latter half of the 15th century. There’s a reason for this, for I have dreamed of such things all my life and the episode above is a typical night’s journey into the past. Even while living a highly romantic life for some years on a yacht sailing the sunny Mediterranean, I slipped into those medieval paths of my dreams. When I started, many, many years ago, to seriously research the period that I already visited once asleep, I found an absorbing fascination in such details. This has never abated. I love to study the principal characters of the era, such as Richard III, Edward IV, Henry VII and all their amazing lords, ladies, courtiers and followers. But it is the ordinary people who inspire me most of all, along with their intriguing lives, limitations, desperate struggles and beliefs . I have always been an author of sorts, an editor, critic, journalist, short story writer, screenwriter, and most of all a reader. And so it came naturally for me to write about the experiences which were already nightly dramas. I have now written several historical novels based around this late medieval period, and although my plots are centred around genuine historical characters and events, it is my own multi-layered storylines inhabited by beggars and soldiers, prostitutes and butchers, thieves and orphaned children, which interest me the most. My books are long – sorry – but with a huge cast of characters and depth of plot, a short book would be inadequate. After all, it takes a long book to relate all the interweaving mystery, adventure, crime and romance that my books involve. I am fussy about historical accuracy, but it is bringing my individual characters to life which I particularly love, since they all quickly become my great friends – even the villains – and I continue caring for them long after the book is finished. 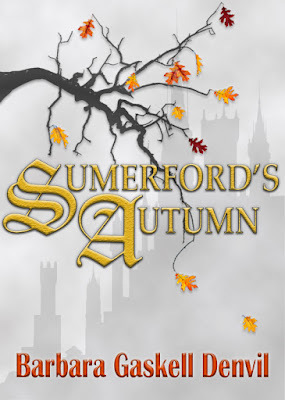 Two of my historical novels have been on sale for some time in Australia where I now live – but I have recently made them available worldwide and now have great pleasure in announcing that SATIN CINNABAR, SUMERFORD’S AUTUMN and BLESSOP’S WIFE are all available worldwide on Amazon. BLESSOP’S WIFE (published as The King’s Shadow in Australia) is a tale of crime, mystery and espionage set against the turbulent times when Edward IV died, and events led to Richard III accepting the throne. SATIN CINNABAR actually starts on the battlefield of Bosworth as Henry Tudor claims the crown of England from Richard III. 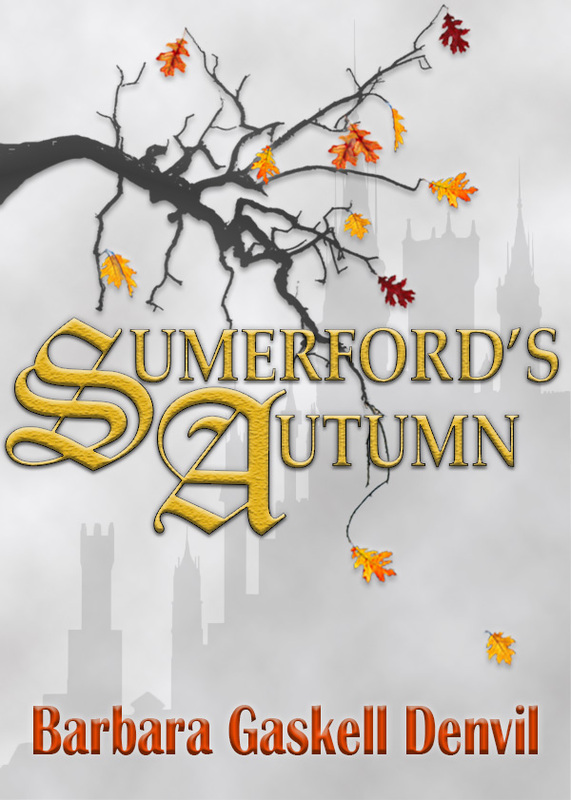 SUMERFORD’S AUTUMN takes place during the first years of the dawning Tudor dynasty when the pretender known as Perkin Warbeck appears in England, claiming to be the rightful king. These books do not lead on one from the other, and each has its individual story and characters. But the dark and troublesome background of late medieval England persists – on the page just as it does in my head. 1483 and Edward IV wears England’s crown, but no king rules unchallenged. Often it is those closest to him who are the unexpected danger. When the king dies suddenly, rumour replaces fact – and Andrew Cobham is already working behind the scenes. Tyballis was forced into marriage and when she escapes, she meets Andrew and an uneasy alliance forms. Their friendship will take them in unusual directions as Tyballis becomes embroiled in Andrew’s work and the danger which surrounds him. 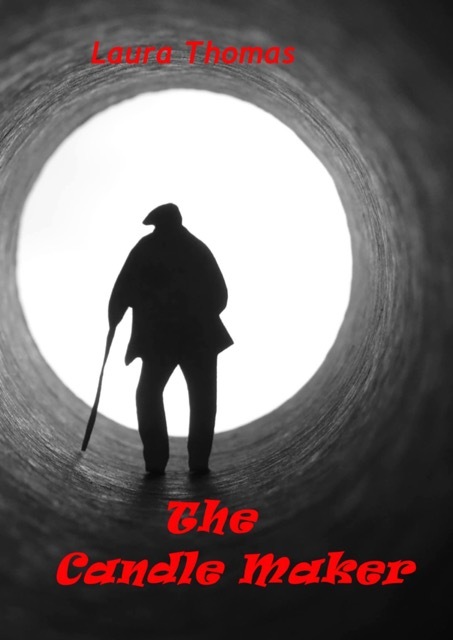 A motley gathering of thieves, informers, prostitutes and children eventually joins the game, helping to uncover the underlying treason, as the country is brought to the brink of war. Learn more about Barbara Gaskell Denvil on her blog. Follow her on Facebook. Purchase Sumerford's Autumn and Blessop's Wife. We all have them: drafts and fragments of stories we tuck away in (real or digital) drawers, assuming we'll never look at them again. Today's guest, Laura Thomas, makes a great case for the importance of hanging onto those old stories. I can honestly say that my latest book, The Candle Maker, was an absolute joy to write—possibly due to writing in the era of “A Christmas Carol”, which always warms the cockles of my English heart. I’m a multi-genre author, and sometimes I get a little turned around writing about a cute, displaced Octopus one day and an angsty, teenaged ballerina the next, but The Candle Maker was one of those stories that comes without the losing of hair or sanity. Bonus! Fast forward a few years and a few published books later, and I stumbled across my old Candle Maker friend in a file. NOTE TO ALL: Never throw a story away, even if you think it’s a painful reminder of how chronic you were as a writing babe. If nothing else, it will serve as a glorious reminder of how far you have come in your writing journey! I re-read the little tale and got to work fleshing out characters and improving the original storyline. With a tad more wisdom under my writing belt, I added a little brother (I have two boys who give me ample fodder for sibling interaction) and an English bulldog (I have one of those, too, so it was an obvious choice—she would have been highly insulted had I used the Red Setter from the original manuscript.) The storyline already implied the ramifications of listening to rumors, and so I built upon that particular moral and added in some neighborhood bullying, a touch of poverty, and the issue of courage. I have to point out that my teenaged sons were flabbergasted that I finally wrote a “dude book” (my previous titles: Tears to Dancing, Tears of a Princess, Fairy Wings, and Pearls for the Bride… say no more!) even though they are significantly beyond its reading target age of 8—11 years. Better late than never. This is my first boy book and I’m delighted with the mix of mystery, history, family values, and the facing of fears. My “little guy”, The Candle Maker, was published by Dancing With Bear Publishing in July 2015. You can purchase The Candle Maker on Amazon. Learn more about Laura Thomas on her website; follow her on Facebook and Twitter. #Coupon Code: MuseItUp Publishing Back-to-School Kids' Book Sale! Fun books for your school-aged bookworms (including my own Ebenezer's Locker). 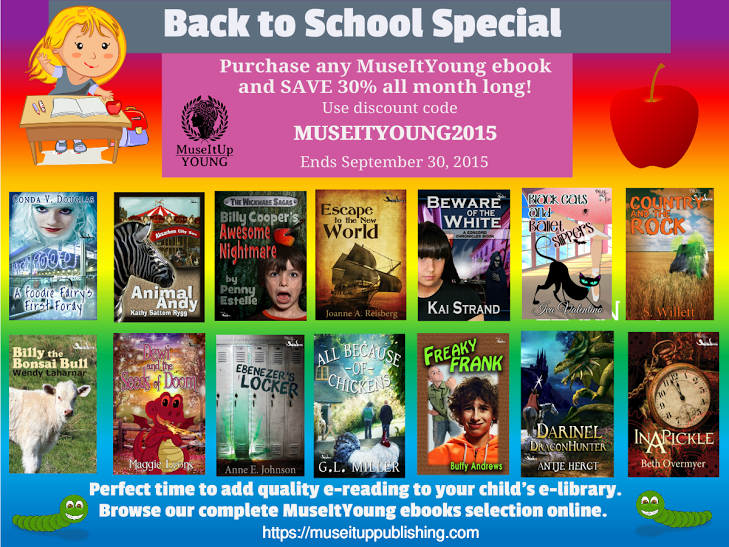 Redeem code MUSEITYOUNG2015 at MuseItUp Publishing through Sept. 30, 2015. 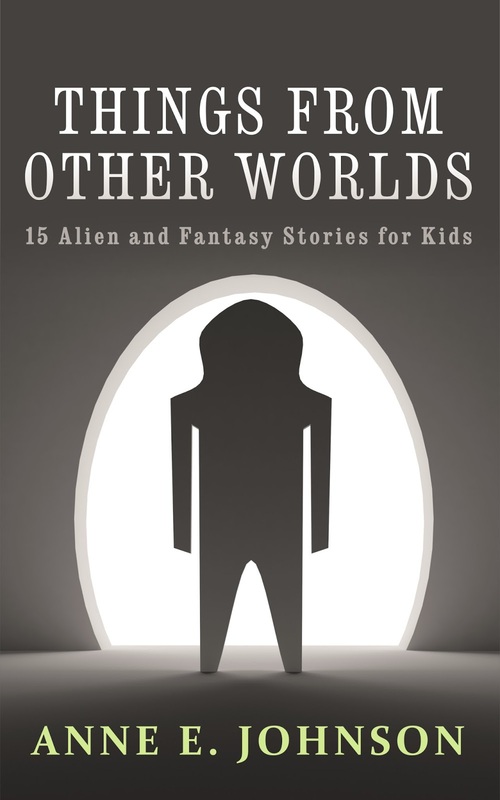 Coming soon: Things from Other Worlds: 15 Alien and Fantasy Stories for Kids. Target launch date for this collection of lower-middle grade tales is October 6. It will be available everywhere ebooks are sold, and I plan a print edition, too. This will replace my Aliens & Weird Stuff series, which I'll pull from Amazon. I've learned a lot since releasing those. Isn't this alien silhouette a great combo of friendly and spooky? I'm tempted to name him. The cover is by James at GoOnWrite.com. Great, fast work that includes image licensing.